When you understand what tomatoes use water for, then it setting up a schedule for watering tomato plants makes sense. Tomatoes are fast-growing, heavy-producing plants. They make a lot of food (sugars) in order to grow blossoms, develop fruit, and put out more branches. It takes a considerable amount of water to convert sunlight into energy for a tomato’s many branches and blossoms. Here’s a quick review from high school biology class about what happens with water in a tomato plant. You can see why water is incredibly important to growing healthy tomatoes. some water is used in the leaves to make food (sugars) for the plant. This process is called photosynthesis, and it’s responsible for converting sunlight into energy for your tomato. some water is released through the leaves to cool them. This process is called transpiration. It’s based on the same principle as perspiration in people. 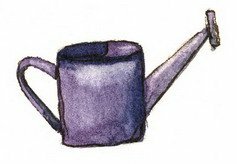 As a gardener, watering is one factor that you can control! It’s simple when you know when, where and how to water them. Water regularly. Consistent watering produces stronger plants and larger fruit. In the height of summer, water 2-3 times a week. (Rainfall counts.) Later when temperatures cool, scale back to once a week. Water at the soil line. 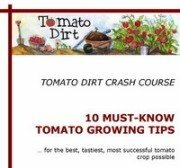 You’ll help build your tomato’s root system. Avoid overhead watering, which spreads diseases. Water slowly. Let water sink into the ground to help plants develop strong root systems. When the soil surrounding your tomato plant is moistened 6-8” deep, you’ll know you’ve done your job well. Drip irrigation is one of the most effective ways to water tomatoes. You an use soaker hoses (also called drip hoses) which you can modify easily to fit your garden. Or do one better and install a drip irrigation system. They're not expensive -- and you will have watering set up for a whole season. You can use a water timer to make watering even more consistent and convenient. Get more ideas on our Watering Tomatoes Pinterest board. Are you watering tomatoes enough? What are the advantages of staking tomatoes?